I remember having so much fun handing out classroom Valentine’s Day cards to my classmates in elementary school. We would all make our own Valentine’s Day themed envelopes and then tape them to our desks. The best part was delivering all the cards to each person’s decorated envelope. That tradition continues today for my daughters. Olivia is 13 now so she might be a little old to hand out Valentine’s, but Bridget isn’t. At age 7, she still looks forward to finding the perfect Valentine’s to send to her friends. Valentine’s Day will be here before we know it and now is the time to get ready. It’s no fun rushing to the store the night before and frantically helping a child address the Valentine’s. Been there done that! That’s why I prefer to shop ahead of time and get everything ready to go long before the holiday hits. Cute right? 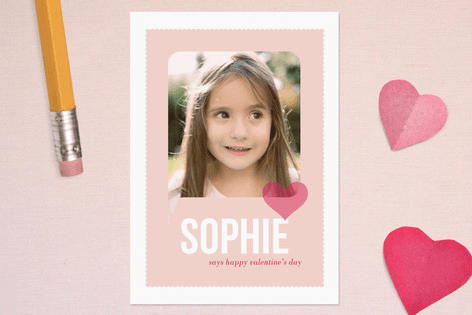 Minted is offering these personalized classroom sized mini-valentines are only $16 for 15. They also have valentine notebooks and full-sized cards in their 2012 valentine collection. They also ship internationally! Check out their collection and find your favourite! One reader is going to win 15 Valentine’s cards from Minted! I like the melonball Classroom Valentine’s Day Cards. My favorite are the hugs and kisses. Melonball Classroom is my favorite (and is fun to say). I love the “Lots of Love Valentine’s Day” cards. It will look so cute! I love the hugs and kisses card.